Lucy was someone’s pet. When they lost the farm, she was going to be sent to slaughter. 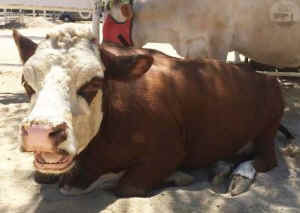 We found out about her and were able to bring her to The Gentle Barn instead. Lucy was accustomed to being on her own, for the most part, without much attention. Now, she cannot get enough attention. She follows us around and enjoys being brushed, hugged, cuddled, and scratched on her neck and shoulders. Lucy was at our other property, The Sun Chlorella Healing Center, so she could enjoy the other cows that live there and the spacious fifteen acres. Lately, however, she has slowed down, and seemed more fragile as she is now in her teens. We brought her back to our main location to have more TLC and be with cows her age. We are so happy to have her back here! Please come out to see her on any Sunday and give her a big welcome hug!